Eunjo “Jo” Park turned down many opportunities to manage her own restaurant in order to focus on cooking. Now the executive chef of the new Momofuku Kawi, she finds herself melding her fine dining background with her Korean American heritage. In the first of a two-part interview, Dave speaks with Jo about her path: from immersing herself in Western cuisine and coming back around to Korean cuisine. The new Momofuku Kawi in Hudson Yards opens on March 15. Hunting and fishing are hot-button topics in the United States. Some embrace them as valuable parts of culture, and some view them as archaic or even inhumane. Dave speaks with renowned outdoorsman Steven Rinella on the ethical debate surrounding meat consumption, the paradoxical symbiosis of hunting and wildlife conservation, and how it all relates to food production. Iconic street skateboarder Eric Koston turned pro at just 16 years old. Now at 43, he still skates professionally and is an active participant in skating culture. Dave spoke with Eric from the Uber Eats House during SXSW about his big night out in Austin, fostering a community within the counterculture movement, and the parallels between cooking and skating. In 2009, when Aaron Franklin and his wife Stacy opened up a barbecue trailer on the side of a highway in Austin, Texas, they had no idea it would snowball into one of the most popular barbecue restaurants in the nation. But Franklin Barbecue wouldn't have become what it is without Aaron’s unwavering commitment to hard work and dedication. A decade removed from the Austin institution’s humble beginnings, Dave speaks with the world-class pitmaster from the Uber Eats House during SXSW about transfusing love and care into cooking, making an intentional effort to maintain work-life balance, and growing the restaurant through failure. In 2013, the activewear market seemed oversaturated, dominated by titans like Nike and Adidas. But in spite of the prevailing wisdom, Ty Haney saw a way to break into that market and founded Outdoor Voices. She was 25 years old. Dave speaks with the OV founder from the Uber Eats House during SXSW about trailblazing in a seemingly too-crowded field and parlaying failure into success, and about their shared experience of being young entrepreneurs. Dave sits down with ‘Patriot Act’ host Hasan Minhaj to discuss how he learned to embrace his cultural heritage, the similarities between food and comedy, and using entertainment to make a difference.‘Patriot Act with Hasan Minhaj’ Volume 2 is available now on Netflix. Eunjo “Jo” Park spent most of her adult life learning to be a good cook. But she never had to learn about being a good chef. In the second of a two-part interview, Dave speaks with Jo about learning from failure and finding an authentic identity for the restaurant.The new Momofuku Kawi in Hudson Yards opens today, March 15. Eunjo “Jo” Park turned down many opportunities to manage her own restaurant in order to focus on cooking. Now the executive chef of the new Momofuku Kawi, she finds herself melding her fine dining background with her Korean American heritage. 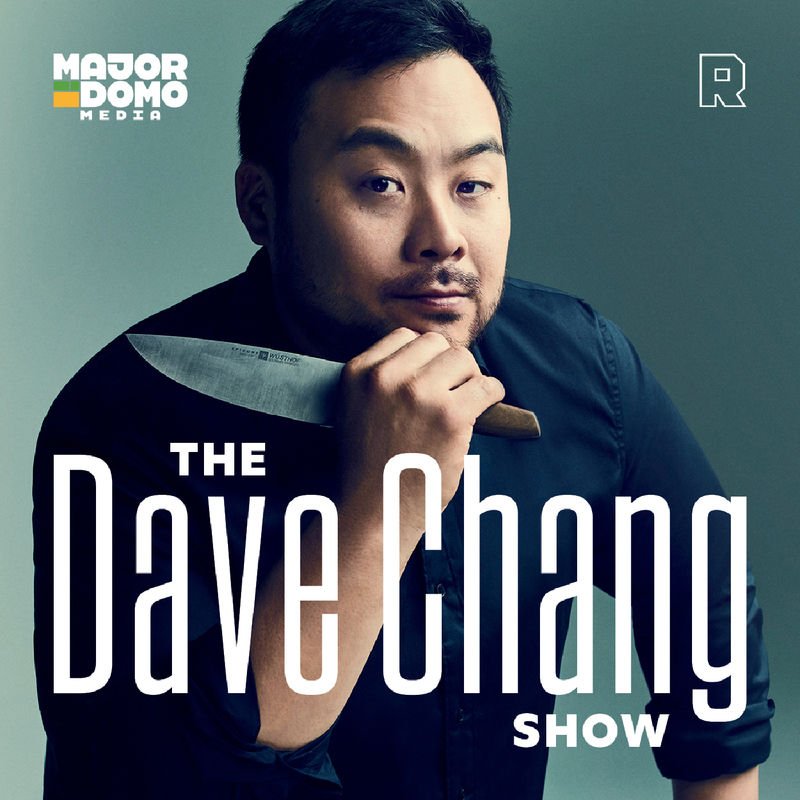 In the first of a two-part interview, Dave speaks with Jo about her path: from immersing herself in Western cuisine and coming back around to Korean cuisine.The new Momofuku Kawi in Hudson Yards opens on March 15. The culinary arts may seem to be only nominally related to the arts, but there are more similarities between the food world and the art world—in both abstract and concrete ways—than you might think. Dave speaks with Pulitzer Prize–winning art critic Jerry Saltz about these parallels. Simple, easy, approachable—these are words that may be used to describe dishes at Sqirl. But the Los Angeles–based cafe did not become one of the most popular restaurants in the city by making dishes in a simple, easy, or approachable fashion. Dave speaks to Sqirl’s chef and owner, Jessica Koslow, about pioneering in breakfast cuisine, the bias against "common" foods, and influencing the rest of the food world. People have subjective definitions when it comes to quality, and food is no exception. To compare one genre of food to another often requires nuance and context, making the whole endeavor that much more difficult. Dave speaks to writer and food critic Lolis Elie about how to evaluate food with care and respect. Spoon by H is an unassuming dessert café located in a strip mall near central Los Angeles. Yet Dave named it his 2018 restaurant of the year on this very podcast. In this micropod, Dave sits down with his producer, Isaac Lee, to explain what makes the Korean American family business so special. The NBA has gone through a significant revolution in the past decade, prioritizing efficiency over tradition. The result? A wildly popular league that garners more attention than ever before. Dave sits down with Ringer basketball analyst Kevin O’Connor to compare embracing innovation in the NBA and in the culinary world. The genre of hip-hop music may seem to have little to do with the culinary world, yet there are parallels between the two that dovetail surprisingly well. Dave draws these parallels out with the help of musician and ’Hip-Hop Evolution’ host Shad. Being a chef is a lot more than just cooking; it requires the ability to manage a kitchen and everyone who works in it. Dave learned the hard way that he needed to control his infamous temper in order to excel as a leader. He discusses this and much more with renowned organizational psychologist and three-time New York Times best-selling author Adam Grant. Noma has been considered one of the greatest restaurants in the world for over a decade. Dave’s longtime friend, Noma head chef and co-owner René Redzepi, takes us through how the Danish restaurant flourished with its extraordinary dedication to reinventing Nordic cuisine.We’re trying something new: Send any questions you may have to askdave@majordomomedia.com. So much has happened to Dave in 2018. Here are his thoughts, unfiltered.We’re trying something new: Send any questions you may have to askdave@majordomomedia.com. As the first year of Majordomo draws to a close, Dave sits down with his key staffers at the Los Angeles restaurant to review the journey since launch. This week, he speaks with the back-of-house leaders: executive chef Jude Parra-Sickels and chef de cuisine Marc Johnson. As the first year of Majordomo draws to a close, Dave sits down with his key staffers at the Los Angeles restaurant to review the journey since launch. This week, he speaks with the front-of-house leaders: general manager Christine Larroucau and beverage director Richard Hargreave. This year has been a memorable one for food; Dave reviews 2018’s biggest food developments with the help of the Podfather, Bill Simmons. And, of course, they talk about some sports too. Chef Jeremy Fox reinvented cooking with vegetables at Ubuntu. But the recognition and accolades, in both earning and receiving, were not without their costs. Dave speaks to the ingenious chef about finding balance and returning to the culinary world.You can find Fox’s new cookbook, ‘On Vegetables,’ wherever books are sold.